New Star Trek director Roberto Orci is the "perfect sense" replacement for JJ Abrams, actor Simon Pegg has said. Screenwriter Orci will take over from Abrams, who is currently shooting Star Wars Episode VII. "He emailed me before the news broke saying: 'Hey man, I might be doing this, shall we nerd out?,' said Pegg who plays Montgomery "Scotty" Scott. "He's a good friend, he's very much part of the Star Trek family," he added. Star Trek 3 will be Mexico City-born Orci's directorial debut. News of his appointment was reported by Variety in May. He has screenwriting and producer credits on projects such as the Transformers films and Mission: Impossible III, and co-wrote both of Abrams' Star Trek films. Orci is writing the story for the third instalment, alongside JD Payne and Patrick McKay. "I'm really happy he's doing it as it's kept within the family kind of thing, it's not somebody coming in from outside," said Pegg, who is set to reprise his role as the USS Enterprise's sole Scottish crewmember, originally played by Canadian actor James Doohan. "Bob's been there since the first Star Trek - by that I mean the 2009 one - so it seemed to make perfect sense that he come in as a director on this one because he gets it. "He was always the most Trekkie of all of those guys anyway, he's always understood the story the best so it's great that he's going to be involved in the writing and directing." 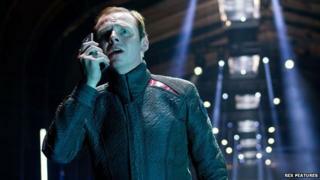 Pegg added Abrams will continue to be involved, not least because his production company, Bad Robot, is making the film. "I don't think JJ would be able to let it completely go because that's not in his nature," he added. Abrams is currently shooting the seventh instalment of Star Wars at Pinewood Studios in Buckinghamshire. Little is known about the storyline but a cast photo, revealed on the Star Wars website, showed the film's original stars Harrison Ford, Carrie Fisher and Mark Hamill joined by newcomers including Adam Driver, Oscar Isaacs and British newcomers John Boyega and Daisy Ridley. Abrams "seems to be the perfect candidate to take on that story," said Pegg. "I'm very excited and obviously I have some inside information because he's a very good friend of mine. "I'm excited to know he's going to be using physical effects and trying to make it in line with the processes that brought about the first three [films]. It's going to feel more like Star Wars than anything we've seen in the last 30 years - I can sleep at night knowing he's at the helm of that." While the story largely remains a mystery, the production has been forced to deal with several leaks of images from the film set. When photos revealed a shot of the Millennium Falcon spaceship from the original trilogy, Abrams responded with a tweet from inside the ship, which showed a handwritten note that read: "I wish people would stop leaking photos from Episode VII and making ridiculous claims that the Millennium Falcon is in the movie." Sci-fi fan Pegg - who is soon to be seen in the comedy drama Hector and Search for Happiness - admitted it was getting harder for audiences to avoid movie spoilers. "It's hard, particularly on social networking sites," he said. "I can police my own interest and know when to back away and not look at stuff like that. I think it's a real shame there are people out there who are willing to spoil the party for a lot of other people. "The people that took those photos and the people that published those photos, I think, are essentially ruthless killjoys. It's a real shame."